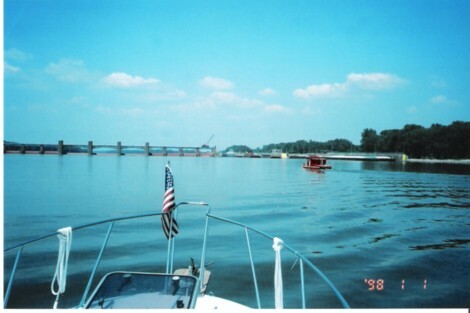 Saturday morning, 16th of July, Lori, Lucky and I launched Izona at the public boatramp in Burlington, IA. We were accompanied by Shirley and Rex Agnew who launched their boat at the same time. Izona was showing 87.4 hours on the meter when we tossed off the lines and started north at about 06:00 hours. We passed under the Hwy. bridge and were soon overtaken by a Jon boat full of fishermen. 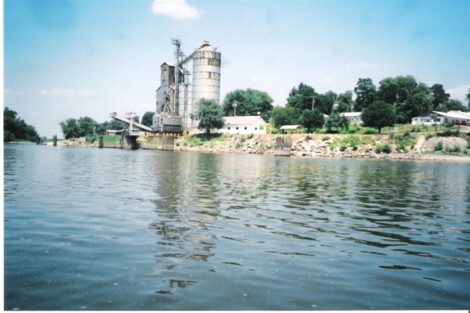 We traveled up river passed Big Muddy's restaurant, Bluff Harbor Mariana and on up to lock and dam 18. 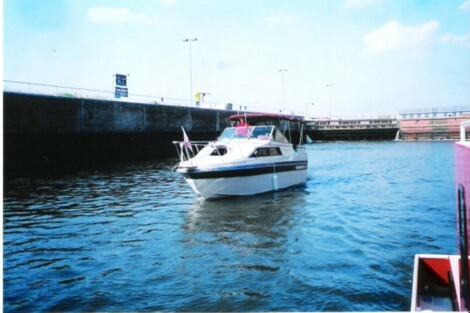 Not sure of the folks in the Jon boat, but that's "Captain Rex" in the lock behind us. 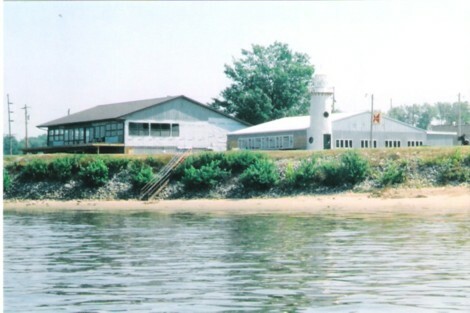 We were thru the lock in less than 30 minutes and continued on upbound past another small marina, and up to Keithsburg Ill. were we took the picture of the lighthouse restaurant. It's being remodeled at this time. Some friends of ours, Cindy and Jimmy (the Mayor of Keithsburg) Stewart, met us in the middle of the river and Miss Izona officially became a tow-boat! About that time we had a visit from the sky! 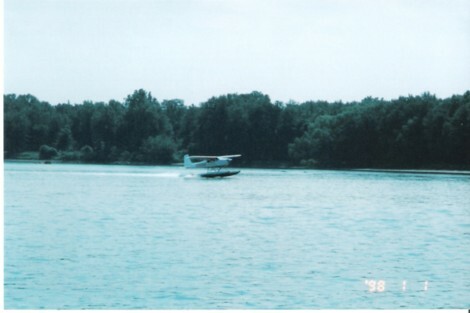 A sea plane did a touch and go, and it was quite a sight. Continuing on northbound we traveled past New Boston Ill. Another quiet little river town, and then on up to lock and dam 17. Captain Rex took a shot of the dam over his bow, and I took a shot of the Corps. 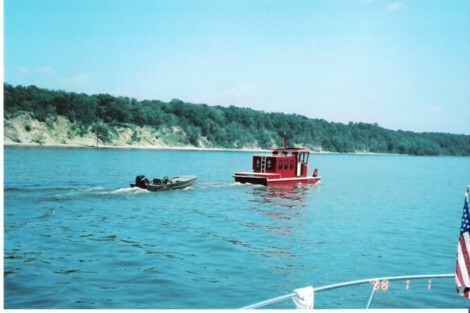 of Engineers equipment and the Towboat Davenport. 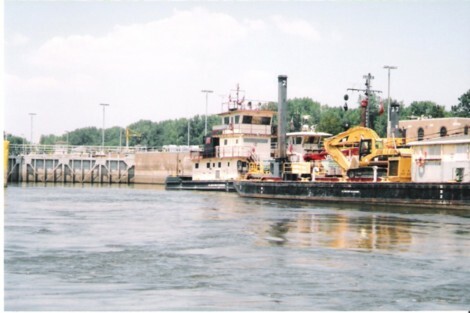 They were tied at the lock, but looked like they were getting ready for some serious work. We turned around at lock 17 and started back down the river. 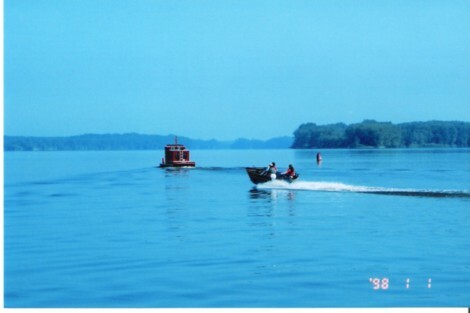 At Keithsburg we said good-by to our passengers and continued on south to lock 18, were again we had no delay! We ran the engine at about 1400 - 1500 rpm all day. Rex said his GPS read 5.5 to 6 mph. We put into the docks at Burlington, IA. at around 18:00 hours. We had a full tank of fuel (50 gal.) when we left the dock, and a half of the tank full when we returned. 12 hour day, 20 to 25 gal of fuel, yes I'm happy! 98 hours on the meter when I pulled onto the trailer. As always, the Izona crew says, "Can't wait till next time!" We made lots of photos this trip, and at least eight of them are included here. Happy Voyaging! !